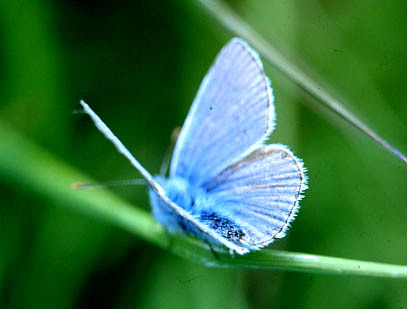 The Lycaenidae comprise the Blues, Coppers and Hairstreaks. So far we have found four different members of the family. This butterfly appeared at Quoditch in August so it is probably from the second annual brood. It has a wingspan of between 32 and 35mm. We found this one on Knapweed in field. It is quite a quick and sensitive butterfly, so, it has taken us quite a while to get a decent photograph.. We have found them in both field one and field two. They seem quite attracted to the heather as well. Its larval plants are docks and sorrels. 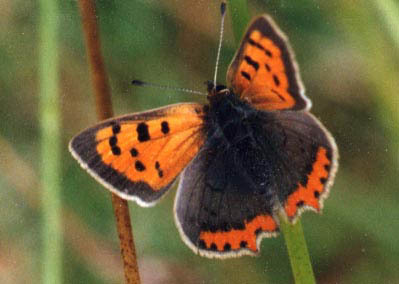 It is a highly territorial butterfly and will attack others who invade its space. It can be found from North Africa right up to the Arctic. We've seen them whilst on holiday in S W France. 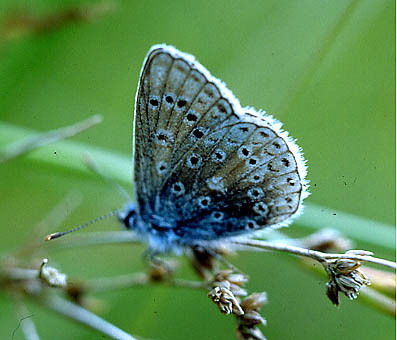 The Common Blue is, as its name suggests, the commonest of the blues. This one is a male, the female has brown on the upperwing as well as blue. It particularly likes clover and vetches as its plant foods. and here is one from the side. It had started to rain quite heavily so the butterfly stayed still for a long time. This is one that we should have, but it has taken us until the end of June 2003 to find one. This one brought itself to our attention by chasing a Red Admiral away from its territory before settling down on a bramble in field 3. They can be quite aggressive. 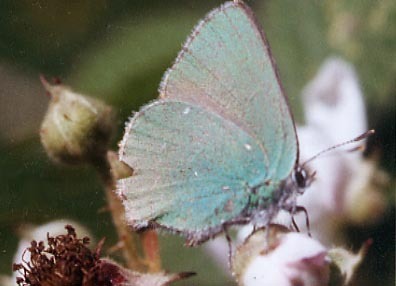 The upper side of its wings are brown but the underside has a most beautiful irridescence on the green. This butterfly overwinters in this country. We have gorse, bird's foot trefoil, buckthorn and bramble which are some of its larval plant foods. Here's the second one we found in, June 2005. This was right by the main gate in Field One. It has quite an iridescence to it that doesn't show up in this picture.